When I was directing high school choir, I eventually added an annual goal to sing one movement from Handel’s Messiah with my advanced choir at our Holiday Concert. I was fortunate in my last few years as a high school director that our district had added a string program, so the school’s orchestra provided accompaniment for that song in our concert (it was a great way to involve everyone). I know that many groups perform the Messiah this time of year, and would benefit from a digital accompaniment track. This morning, a PreSonus presentation from ASME 2017 showed up in my feed, and I watched it. It featured Chris Swaffer, a developer from PreSonus, which makes Notion) and Dr. Ian Cook. Chris introduced Notion, integration with Studio One, and the live performance capabilities of Notion ; Dr. Cook discussed Persons’ conducting component (great for college programs). I have interacted with Chris for a long time (I get the opportunity to try Beta updates for Notion), and it was great to actually see him (he’s in the UK, so he doesn’t make many music education conferences here in the USA). As I was watching the presentation, Chris mentioned that Notion includes a number of resources, including the FULL MESSIAH. Remember…Notion comes stock with sounds from the London Symphony Orchestra. You can buy the full expansion pack of sounds (currently $299–which is a bargain compared to other sound packs from other vendors). Otherwise, Notion (on Mac/Win) is $150. 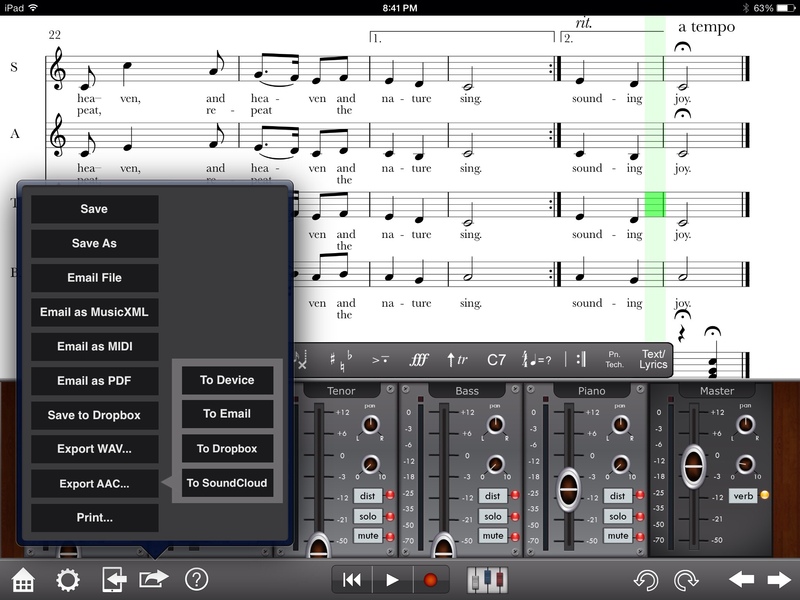 If you are a director needing a rehearsal or performance tool for the Messiah, Notion would instantly pay for itself. I didn’t know about these included files, and you can find them in your account at my.presonus.com. Then follow the links to “Get All Content” and then add the “Notion Score Library” in the “Extra Downloads” area. This will send you a zipped file of Notion files (all in the Public Domain) that can be edited as necessary. In my.presonus.com, look at “Get All Content” with Notion 6. About the Messiah…it doesn’t have text in the voice parts, so if you want those, you may have to add them…and it ships with all of Part 1 and Part 2 as separate files. That said, as it is a Notion document, you can certainly cut and paste a range of the song and paste it into a new document and add text to those voice parts. Here’s the full screen view, in “pages across view” of Part 1 of the Messiah, which is included as a extra download when you buy Notion. Notion’s sounds are great, and are probably worth the initial cost ($150). Don’t forget that you can add the iOS version as well, with all add-ons, for around $50 total (bargain! ), and anything you do on Notion for Mac/Win will show on the iOS version. However, if you want to use Notion’s excellent stock sounds and run a humanized performance, you can do so with Notion’s live performance features. I haven’t done that, but I know that Paul Shimmons did so recently, making his own “pit orchestra.” Read about that here on his website, ipadmusiced.wordpress.com (link). And if you are a user of another program, as I am (e.g. Finale), Notion can read MusicXML and export MusicXML, so you could easily to and from Notion. In other words, you don’t have to leave your current program to add Notion as a tool. 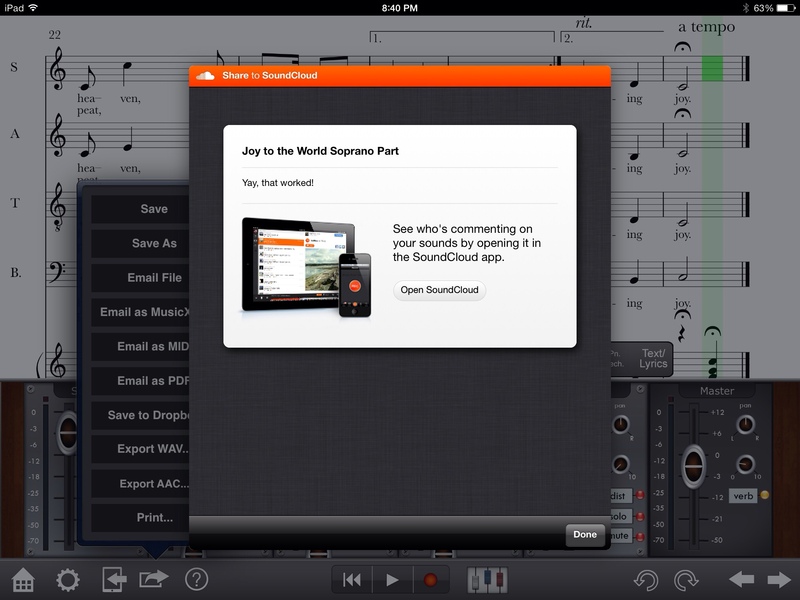 If you have an iOS device, and you are a music educator, Notion should already be one of your tools. Note: This is NOT a sponsored post by Notion, I just love the program, and yes, I am a beta tester of the product. Just a note about a couple of recent updates…both Finale and Notion have been updated in the past 48 hours. If you have Finale 25 or Notion 6…you will want to download those updates and check out what is new! Several weeks ago, Paul Shimmons (ipadmusiced.wordpress.com) and I talked to Micah Blouin from PreSonus about the new version of Notion 6 and other offerings from PreSonus for music education on the ME&T Podcast. Check it out if you haven’t already done so! One of the things Micah discussed was “pinning” a WAV file audio track to a Notion score, and using their feature called N-Tempo, where you can “tap” a tempo into a score to sync it to the WAV file. He mentioned that this feature was great for transcriptions. I recently contacted an artist about the possibility of transcribing a song of theirs so my 8th grade students could sing it in our spring concert. I received permission today, and since I am still recovering from a bad cold that hit two days ago, I began working on the song. In Notion, I suggest creating a separate instrument to “pin” the WAV file to, and if you don’t have a WAV file, there are plenty of web-based sites that will convert existing audio to a WAV format. Just keep in mind that WAV is an uncompressed file format–so a audio recording is easily ten times larger than other popular formats (mp3 or Apple’s m4a). Then you make a N-Tempo instrument track, and you plan the rhythm you want to tap to. If you are working with an artist that shifts tempo freely, it can be better to make the N-Tempo track the same as the melody part. Then you enter Notion’s N-Tempo recording tool (it looks like a joystick) and tap the tempo using any key on the “A” row of your keyboard. To stop recording, hit space or ESC. Side note: I have used “tap tempo” in Finale, which requires the space bar. It took a look in the manual to realize that the space bar was NOT the entry method for Notion. It helps if your WAV file starts with the downbeat…so use an editor to trim your audio before importing it. At any rate, using this method made the transcription easy and fast, and I would definitely recommend it to any one. I will certainly be using it again! P.S. “O Hanukkah, O Hanukkah” was NOT the score I was entering today. I just used it as an example as it is in the Public Domain. On my ukulele website, ukestuff.info, I created a post showing how to use Notion to create in-line ukulele fretboard symbols to make a lead sheet. This is really crossover material, as it involved technology and music education, and some of you may want to add other types of chord symbols in-line to your own lead sheets for students. One of the huge problems with the iPad for music education is the inability to save music on the iPad music library unless you sync with iTunes. I have written Tim Cook about this multiple times over the years, and will continue to do so every six months or so until things change. Here's the problem: in our 1:1 iPad situation, iPads are basically never synced with a computer. We sync them with an original profile, and then everything else is done away from the computer, unless the device needs to be reimaged. Everything else a student needs remains in the cloud. If you can only save audio in the music library by syncing, you cannot save music to the device. I have been trying to find a way to get audio into a music library so that apps like forScore and unrealBook can access audio files I've created as accompaniment or rehearsal tracks for my choir students. I also wanted to see if I could find a program that would allow students to open an audio file and record a second track over the audio file (authentic assessment), and then export that file to Google Drive (our iPad initiative is also linked to Google Docs). Neither one of these things is possible right now, although Apple could make both of them happen with GarageBand, nearly instantly. If you could import music into GarageBand and then save to your music library (like Photos), that problem would be solved; and if you could import music into GarageBand, you could simply insert another track over that recording. I am further limited in my search for apps as they need to be free–we have no budget for apps. So although I would love to provide forScore or unrealBook for my 225 students, we have settled on using PiaScore. We're making it work, but I despise the YouTube component in PiaScore, as some of my students use their time in choir watching videos (with no sound) rather than singing. 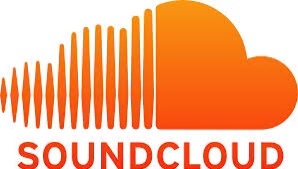 A number of fellow music education “techies” have suggested Soundcloud as a possibility for my use, and I am reluctantly going that way for rehearsal audio files. I can't find a solution for importing a track from Google Docs, recording a track over that track, and then exporting the entire recording to Google Docs again. 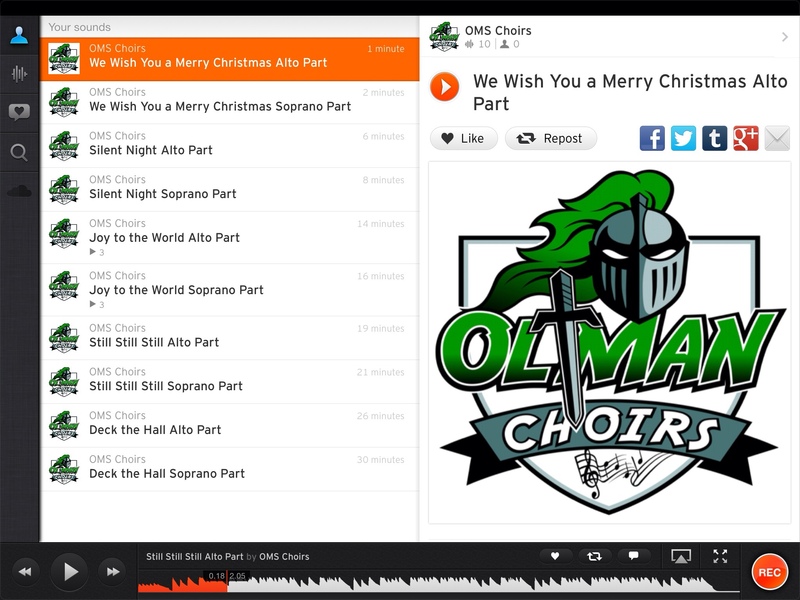 When I taught high school for the past 17 years, I had a caroling ensemble each year, and I eventually developed my own collection of carols, edited by me, that we sang. We stuck to traditional songs (although I did make fun arrangements of a few songs like “Rudolph, the Red Nosed Reindeer” and “I'm Getting Nothing for Christmas”) because that is what people want from caroling groups. By the end, each part had its own lead sheet (Sopranos with a soprano only part), as this allowed each song to fit on one page for each singer. I still have all those resources. Caroling groups, particularly extra-curricular groups, are still encouraged in our area. That Minnesota/St. Olaf/Luther/Concordia tradition is extremely strong here. But now I teach middle school choir, and my students just aren't as vocally and musically developed as my high school students were–and this isn't a shocker. But I decided to start a caroling group for our middle school, and I have fifteen brave souls that I am now teaching two-part carols to. Many of the carols are coming from Joe Ambrosio's “Carols for Choirs,” which are two-part carols (but written in Soprano-Tenor; Alto-Bass configuration), and my colleague Reid Larsen at one of our other middle schools brought my attention to those carols last year. Each of these carols also has a piano accompaniment to support the singers. I hope Joe adds a few more carols in a second set (I need to find him and e-mail the suggestion). I am adding other carols to Joe's songs, creating a set of accompanied SA carols for my singers to learn. We rehearse once a week on Tuesdays after school. My process is to scan the music in PhotoScore Ultimate, export as a MusicXML, open into Finale, clean up the score, export it as a MusicXML, and to import it into Notion for the iPad. Notion becomes my piano player for rehearsals and works quite nicely (I'm looking forward to future N-Tempo features in Notion). If I want to make a rehearsal track, all I need to do is to adjust some sliders in Notion, and export the audio. If this seems like an involved process, I did about seven carols in less than two hours the other day. PhotoScore does a great job with less complex vocal scores (and it struggles with very complex vocal scores, like any other scanning software). You can export from Notion to Dropbox, but you can also export to Soundcloud. Exporting is SO easy on the iPad; it is one of the main reasons I love Notion for the iPad. I installed Soundcloud tonight, and did a test before deciding to move forward. You can open PiaScore, then open SoundCloud, find a recording, and then switch back to PiaScore and use your music with the recording. This isn't as good of a solution as “binding” an accompaniment in forScore or unrealBook to a song–but it works. And it is free. So this is what I will be doing for now. I am also going to e-mail forScore and unrealBook and find out if it would be possible to link to a SoundCloud file (yes, Internet access would be needed). I can't afford copies for all 225 students in my program, but I could find a way to pay for 15 students in my caroling ensemble.